The American attack is devolving. Against Scotland, they scored 5 goals in a variety of ways; against Brazil they scored one slick goal and forced a number of saves from young keeper Rafael; but against Canada they never seemed likely to ripple the net. Why couldn’t the USA penetrate the Canadian defense? On paper, this was the most attack-minded squad of the three friendlies. Clint Dempsey and Landon Donovan were finally on the field together under Jurgen Klinsmann, and the gaffer even managed to include Iniesta-like José Torres alongside the accomplished American attacking duo. It didn’t work. A very attack-minded personnel grouping backfired, as Dempsey struggled to influence the match. The formation most closely resembled a 4-4-1-1 or a 4-2-3-1. 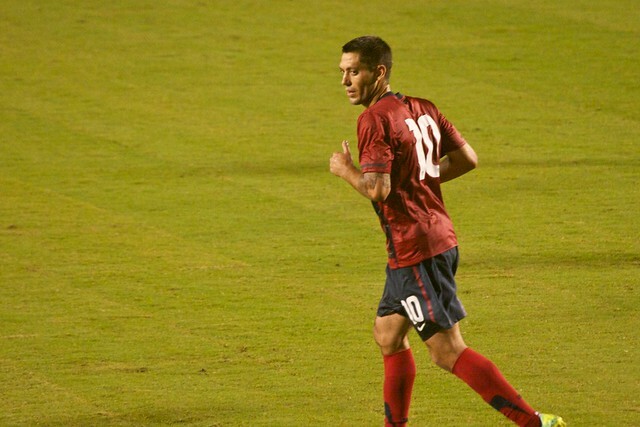 But Dempsey and Torres roamed quite a bit, making the overall shape pretty fluid. Both players tend to cover a lot of ground, though last night’s movement was often excessive, especially for Dempsey. He spent a lot of time near or behind the midfield line. At one point in the first half, Dempsey and Torres were both behind holding midfielders Michael Bradley and Jermaine Jones. This movement created quite a discord in the build-up play. Herculez Gomez, nominally Dempsey’s striking partner, often found himself far afield of any other US attackers. 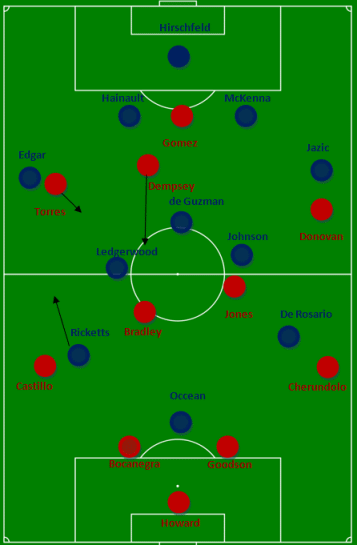 On one of the few occassions Dempsey received his first pass in a possession in an advanced position (40th minute), Donovan and Dempsey combined to create a shot and win a corner. This sequence looked fairly similar to an old Bob Bradley standby. The striker, Gomez, pulled wide to stretch the defense as Dempsey and Donovan charged inside. It was one of the few promising attacking possessions of the evening. Almost half of Dempsey's completed passes occurred behind the midfield circle. USA’s success at posting a goose egg also had a lot to do with a puzzling reliance on crosses. The gringos attempted 27 crosses (5 successful), which was an order of magnitude higher than in either of the previous matches. They attempted 18 against Brazil (9 successful) and 13 against Scotland (3 successful). What made the strategy so odd was that there was rarely anyone in the box to take advantage of the service. Jermaine Jones appeared to be the target of a number of crosses to the back post, but Dempsey was often too deep to be of any use and Gomez needed someone to take defenders away when he made his run. Given the positioning of Dempsey and Torres, the strategy didn’t make much sense. Any time one squad fails to score, it’s worth taking note of the opposing team’s performance. And Canada certainly performed well. When they didn’t have possession – which was 62% of the time – Canada used a defensive 4-5-1. They dealt very well with the avalanche of crosses, making 17 of 27 successful clearances. They also did a good job preventing the Americans from developing any fluidity in the final third. They won 9 tackles in their half of the field (and 10 of 12 overall) as well as making 17 interceptions in the same area. Their disciplined play shamed the Americans, who far too often looked shaky dealing with Canada’s forays into the final third. The Canadian’s sound defending, along with the weird reliance on crosses and roaming of Dempsey, conspired to prevent the Americans from developing a consistent attack. Klinsmann will need to do some tinkering before Friday if he wants to keep using Dempsey and Torres together. Any thoughts? Or were you as puzzled by the display as we were? I also don’t understand why Bradley was pushed back against Canada. It may have made sense against Brazil, but not against a countering Canada. Dempsey > Torres, most definitely. I do think they can play together against lesser opposition, though only if A) Dempsey stays higher and/or B) Torres stays in middleish areas. Some other obsverations: Cherundolo may be near the end. I love him, but he is no longer overlapping with Donovan (or whomever is at right mid), and his positioning is far too cautious because he knows he can be beat. So he plays RB too conservatively and the USA cannot establish any meaningful width on that side. Klinsmann’s neglect in bringing along Lichaj is difficult to understand. Castillo does not provide the depth the US needs at LB. Fabian has been a wonderful development-credit Klinsmann there. But all of Castillo’s deficiencies were on display last night; he can’t defend, he’s easily pushed off the ball, and he can’t attack. Let’s face it, Canada should have won due to Castillo’s miscue. JK really, really needs to move on from him. Blake and James are both right on. Having both Dempsey and Torres in roaming mode was a little too much–it might have made out attack unpredictable but in all the wrong ways. I’d like to see Deuce back out as the mercurial left mid. Torres has been a fresh breath of creative air, but let’s use him when we need a creative central mid, maybe alongside Bradley while Edu plugs the hole in back. Then that leaves us with a newly energized Jones with nowhere to go! I guess too many good central mids is the kind of problem you’d like to have. One last note on our defense: of all the center back tryouts these three games I’ve liked Goodson the best. At the rate Jones is going with yellow cards, he won’t be able to play more than two or three matches in a row anyway before needing sit down. I see plenty of opportunity for Torres in an three man central mid role. I concur on Goodson as well. But that is a little scary too! Clarence Goodson is our most competent central defender? (Say that to yourself a few times…) We now have credible class and potential in the midfield and forward groupings (Bradley/Donovan/Dempsey/Altidore), but I think a serious issue is developing on the backline. Aside from Fabian Johnson, what are we looking at? It is time for Klinsmann to get Lichaj into the mix at right back. And JK’s #1 priority must be identifying center back replacements mucho pronto. Whether it is Ream, Cameron or player unknown – the time is now. Otherwise, our defense will look like a shredded sieve come Brazil 2014 if we are still relying on a combination of Boca, Gooch and Goodson. I’m right with you, James. The back is looking too creaky. In our post 2010 WC advice to Bob Bradley, we discussed how he needed to find some young blood at the back. Klinsmann has obviously been trying, but it’s a difficult process. We’ll have more thoughts on the backline in our WC qualifier preview on Thursday.